Infosys under Narayana Murthy for the first time picked an outsider Vishal Sikka as CEO on Friday. Infosys has enough senior managers to run the business even if more executives leave India’s second-largest IT services exporter, its founder NR Narayana Murthy said on Saturday, after a spate of staff exits triggered concerns about a leadership vacuum. Narayana Murthy played down the departure of at least 11 senior executives since he was brought back from retirement in June last year to help regain market share, saying some of them were low performers. Infosys has for the first time picked an outsider Vishal Sikka, former senior executive at German software company SAP AG as CEO, as it seeks to boost sales of high-margin services and stem a staff exodus. “We are confident that we have enough budding leaders to handle any eventuality of some more people leaving us,” Murthy, who stepped down as the chairman of the company on Saturday, told an annual shareholders meeting. The annualised rate of attrition at Infosys – the number of staff leaving or retiring – was a record 18.7 percent at end-March, 2.4 percentage points higher than a year earlier, out of a workforce of more than 160,000. The departures included at least 11 top executives, some of whom were responsible for key business sectors at the company, which was founded by Murthy and six other engineers in 1981. “Some had been identified as low performers by the external evaluation agency and the board. Some were evaluated to be low performers by senior management,” Murthy said, playing down concerns of the management exodus on the company’s growth. 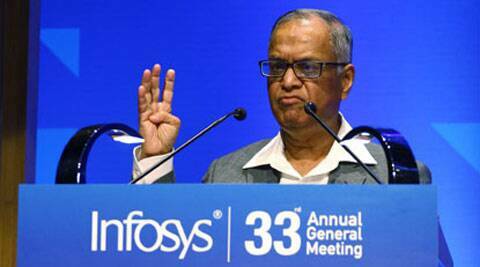 Infosys, a pioneer in India’s $100 billion-plus outsourcing industry, was taking several steps to bolster innovation and tap new technologies, as “commoditisation” of the company’s core IT outsourcing business increases, Murthy said. Infosys, like its local rivals Tata Consultancy Services and Wipro, has relied for decades on labour-intensive, low-margin contracts from Western clients including Citigroup and BT Group Plc. “The silver bullet for this company and this industry in the medium to long term will be how much of what we do today can be done faster and cheaper by employing intelligent software agents,” he said. Infosys shareholders are betting on Sikka, who will take over on Aug. 1 from current CEO S.D. Shibulal, to turnaround the company by tapping opportunities in new technology areas including cloud computing and mobility. Sikka, 47, is considered to be an innovator in the global software industry. A computer scientist by training, he was key in developing and marketing SAP’s flagship product, HANA, which helps firms analyse large amounts of data quickly.